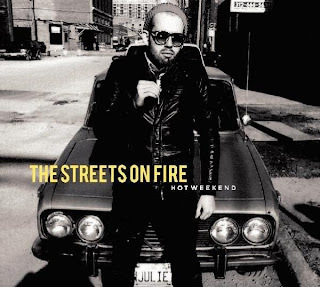 Chicago indie four piece The Streets on Fire formed in the not-too-distant past in a rundown currency exchange, setting the stage for what would become their debut release, Hot Weekend. The eight-song result is a lo-fi garage-dance-post punk hybrid that's down-and-dirty yet accessible in all the right places, brimming with energy and rock 'n' roll swagger. Standout tracks such as "1964," "Flannel Attack" and "Supersonic Lovelife" are frantic, revved-up bursts of fun with hints of menace and madness, featuring in-your-face guitar work from Yuri Alexander, hard-hitting percussion from Gabriel Palomo and the infectious, fuzzed-out bass lines of Sebastian Brzek. Most immediate, though, are the distinctive vocals of front man Chadwick, whose delivery wavers from cocksure to dangerously near nervous breakdown, giving the material an extra shot of personality. Hot Weekend is a solid introduction that should be a hit with any fan of gritty, danceable rock and roll. Listen to a track below and get the album now on iTunes and Amazon MP3. The Streets on Fire - "Supersonic Lovelife"
The Streets on fire will play Cal's Bar on Saturday, November 21 with Michele Ari (interview here), Tommy Ache & the Terrible Mistakes and A Sample Life (400 S. Wells, 10 p.m., $5). The band also have shows lined up for December 12 at Bottom Lounge and January 21 at Double Door. THE STREETS ON FIRE - "We Play With Tigers" music video from Conor Simpson on Vimeo.